Way down inside. . . Whether new or old, adjustable or not, all kinds of truss rod have the potential for buzzing if they fit just a little bit loosely inside the neck. 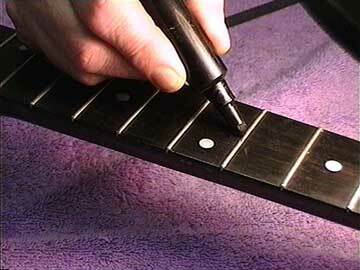 Most of the time, a loose truss rod causes a buzz that appears to come from the peghead or neck. 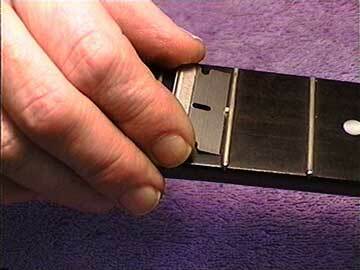 Also, most of the time, it is possible to hear the truss rod rattle if you rap hard on the back of the neck. 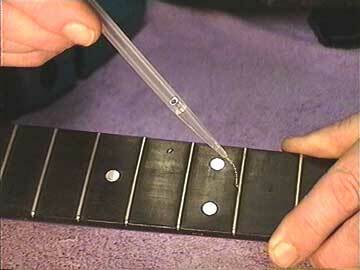 I remove the nut and coat the threads with oil so any stray drops of glue won't interfere with the truss rod adjustment. Even bit of regular wood glue mixed thin with water does the trick nicely. The low viscosity glue will wick down inside the channel and simply get in the way, filling the tiny gap where the rod rattles. Sometimes, I'll need to use a regular medical type hypodermic syringe to get enough pressure to get the glue in there. Won't the glue prevent the truss rod from working? Most truss rods are tensioning devices that have an adjusting nut at the end. Regular wood glue can't keep that sort of rod from working, as long as it doesn't get on the threads and interfere with the adjusting nut. The tension on the rod is so great it will immediately break any glue bond inside the neck. Of course, you wouldn't use cyanoacrylate for this job! Remember that the glue is just there to fill up a tiny gap so the rod won't rattle - not to bond the rod to anything. Well, then, how about two-way adjustable rods! Yes, that can be a problem. 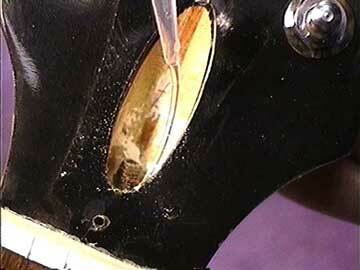 You shouldn't use any kind of rigid glue if the rod itself must turn inside the neck. You can easily identify that kind of rod because there isn't a removable adjusting nut. The "nut" is brazed on the end of the rod. If you need to fill the gaps around a rotating type of truss rod, be sure to use nothing but very diluted rubber cement.